Welcome to the latest chapter in our history of Team17’s first 100 games, celebrating the release of game number one hundred, PLANET ALPHA. In this chapter, we’re looking back at 2007 & 2008, when Team17 began to explore the world of digital distribution on PlayStation Network and Xbox Live Arcade as well as the burgeoning motion control craze with Nintendo Wii exclusive, Worms: A Space Oddity. Missed a previous chapter? Head back to 2005-2006 or start at the beginning in 1991! A few months after we remade Lemmings for PSP and PlayStation 2 we were back at it! This time in a download-only sequel for Sony’s fledgling PlayStation Network on PS3. 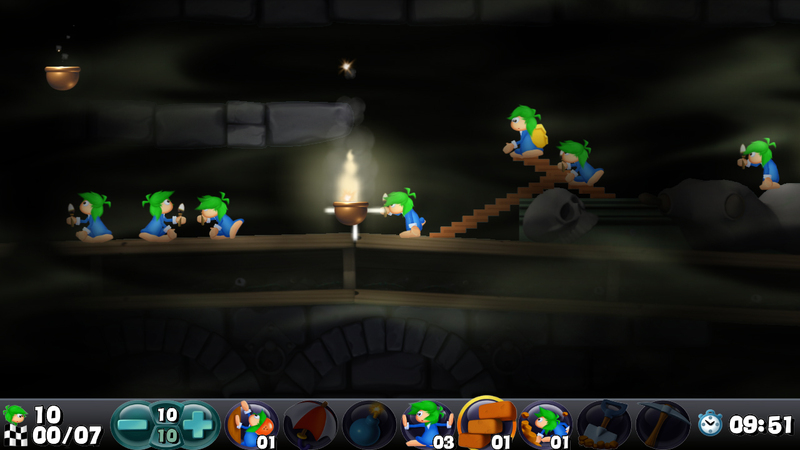 PS3’s Lemmings was Team17’s final game in the series, but the design experience learned from working on the series… That was put to good use on Flockers. Check back soon for more on that! By 2007, it’s fair to say that the digital revolution was only just beginning. Steam had been around a few years, the iPhone was just around the corner and Xbox Live was well established on Xbox 360. It’s on this platform that we decided to take Worms back to its roots, with an accessible 2D game that could be sold at an affordable price and take up only a small amount of hard drive space. 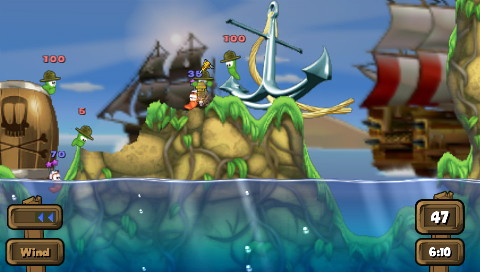 Essentially a HD port of PSP’s Worms Open Warfare, the simply titled Worms could almost be regarded as an experiment. It’s hard to appreciate now, but the idea of players paying for downloadable software was still a relatively unproven concept. But it didn’t take long for the results to speak for themselves. The Xbox Live Arcade release was a smash hit! 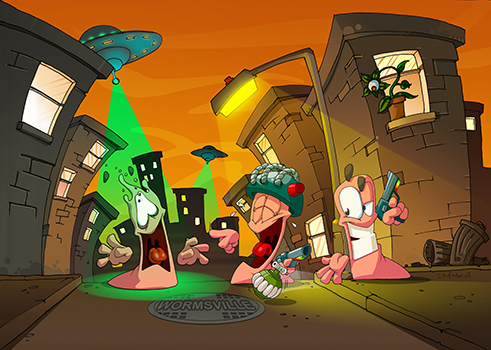 In 2009, Worms was ported to both PlayStation 3 and smart phones. Re-designed for touch screen controls, the game translated remarkably well to iOS and Android and in the process found a whole new level of success. The combination of the smartphone explosion, low price point and brand familiarity made Worms a phenomenon yet again and started a whole new mobile sub-series for the franchise. But the success of Worms wasn’t just limited to the series… Its success proved the viability ot digital distribution and self-publishing, paving the way for a bold new era of Team17 that was just around the corner! 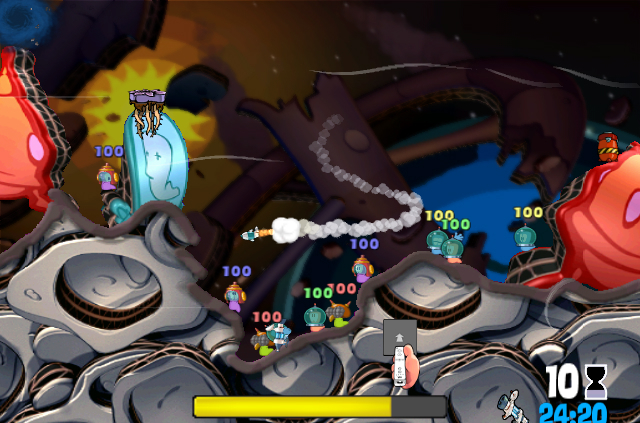 With a little more time to work on the sequel, Worms Open Warfare 2 was generally considered by the team to be a superior game, and critics seemed to agree. Praise was high, particularly from GameSpy who called it “the best Worms game yet”! More a polished iteration of what had come before, rather than a reinvention, Worms Open Warfare 2 did nevertheless contribute some important additions to the series. The “Bunker Buster”, designed to drop right on in cowardly darksiders hiding in tunnels, has pretty much been a staple of the series ever since, while the “Buffalo of Lies”, previously only mentioned in classic Worms games, finally provided a counterpart to the Concrete Donkey and rewarded longtime Worms players, hungry for a bit of tasty lore. Packed full of little features to keep wormers happy, one of Open Warfare 2’s smartest additions was one that looked all the way back to the original Amiga game. A level editor! A little bit like the Graffiti mode in Worms: The Director’s Cut, this feature allowed players to sketch the outline of a landscape and then populate it with landmines for an instant, unique stage that could even be shared with other players. A nice touch, even if we do say so ourselves! 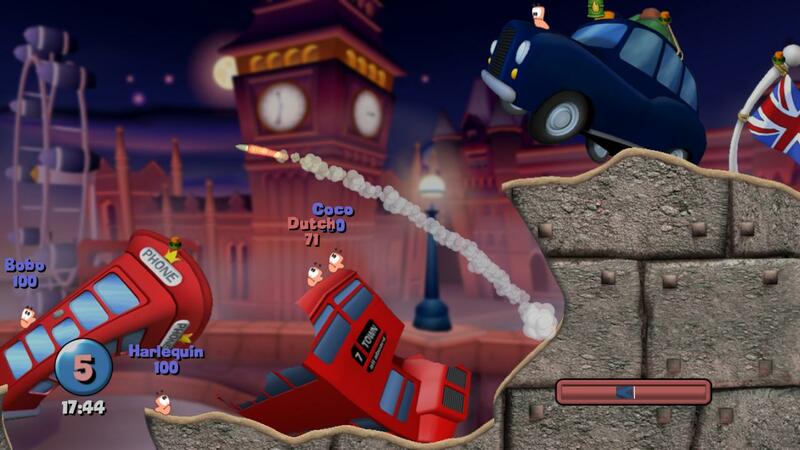 A true oddity within the Worms series, this 2008 release was the first and only game to be entirely based around a single theme, was the first and only Worms game to be designed exclusively for a Nintendo system and the only one to feature motion controls! If you look closely you might see that the landscapes are actually formed from corrugated card, partly inspired by the Japanese box art to Yoshi’s Story. That’s all for this chapter. We really hope you’ve enjoyed this snapshot of Team17 history. In the next instalment, we’ll look back at 2009,the year in which Alien Breed made its long-awaited return and we got to work on another classic Amiga IP too! Check back soon to find out what that was!